Figures 1 and 2 illustrate the evolutions of the weekly sea surface temperature anomalies from the first week in a given year through the 60th week, so the data stretch into the first few months of the second year of each El Niño. 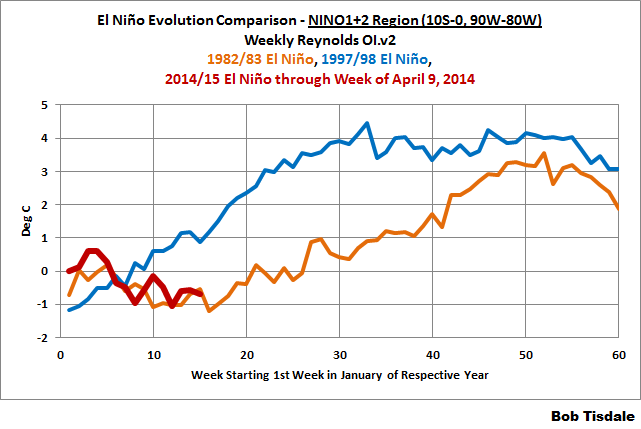 (El Niños normally peak in boreal winter, because they are tied to the seasonal cycle.) 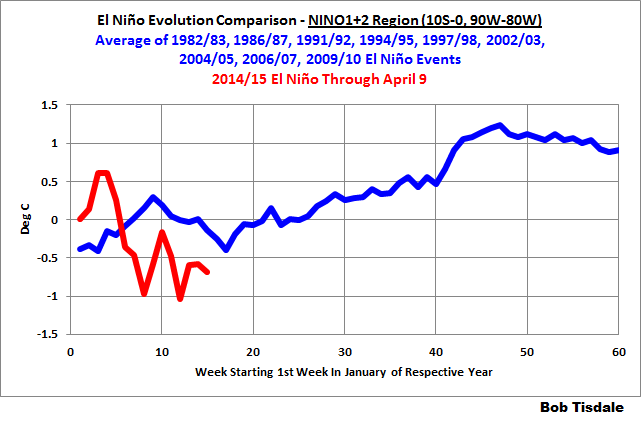 The NOAA Oceanic NINO Index (ONI) was used as a reference for “official” El Niño events. We’re using the weekly Reynolds OI.v2 data, which starts in late 1981. 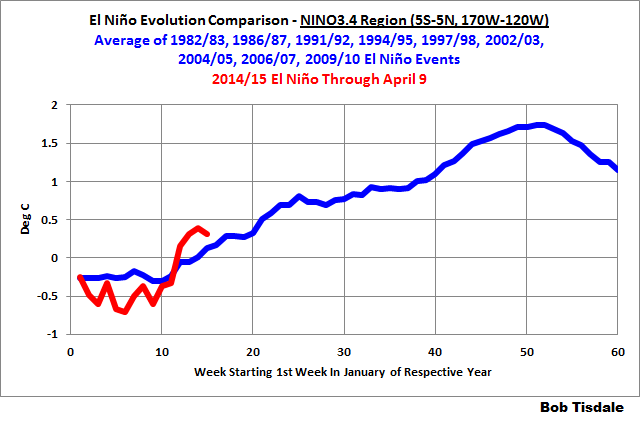 In addition to where we stand so far for the 2014/15 El Niño (highlighted in red), Figures 1 and 2 also include the evolutions of the sea surface temperature anomalies for the 1986/87 El Niño, 1991/92 El Niño, 1994/95 El Niño, 2002/03 El Niño, 2004/05 El Niño, 2006/07 El Niño and the 2009/10 El Niño. Figure 1 is for the NINO3.4 region, which is located on the east-central portion of the equatorial Pacific (5S-5N, 170W-120W). Figure 2 is for the NINO1+2 region, and it is located in the eastern equatorial Pacific (10S-0, 90W-80W), just south and west (oops) east of the Galapagos Islands. Fascinating work, as always. If we were in normal times you would be publishing a column in a mainstream science publication with the goal of explaining science to the public. An implication I take away from your recent work on El Nino is that el Nino is a spectrum of phenomena, not just a particular event. Is that correct. hunter, to prevent me from going off on a tangent, please clarify “spectrum of phenomena”. Thanks, Arska. Have you also checked the Arctic Oscillation and North Atlantic Oscillation? I have been following but only comparing with 97/98 (major) and 09/10 (latest). It would appear (will stand correction) that the present, if it plays out, is starting from a higher global SST base. Approx +0.3c (Reynolds Wk 15) versus approx 0.15C for 97/98 and 09/10. I know you are a busy man but do you have any thoughts on how this event may affect global SST? Green Sand: There are toooo many unknowns. 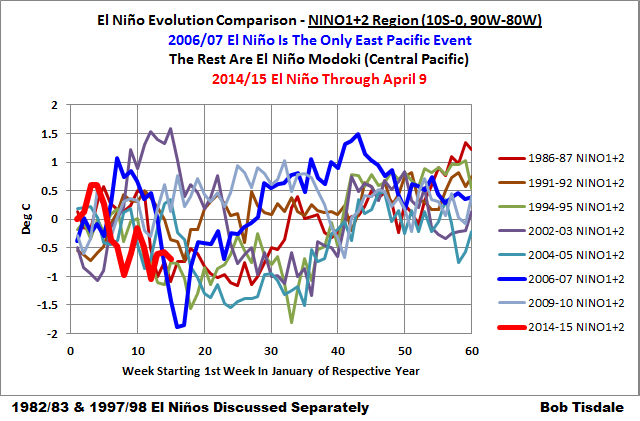 Will it be an East Pacific or a Central Pacific El Nino? It looks like it might become an east Pacific event, but much can change. And how strong will it be? Dunno. A strong central Pacific El Nino would likely cause an upward shift in the sea surface temperatures of the South Atlantic-Indian-West Pacific sea surface temperatures, but a strong East Pacific event would likely cause a greater shift. Another big question is the North Atlantic. 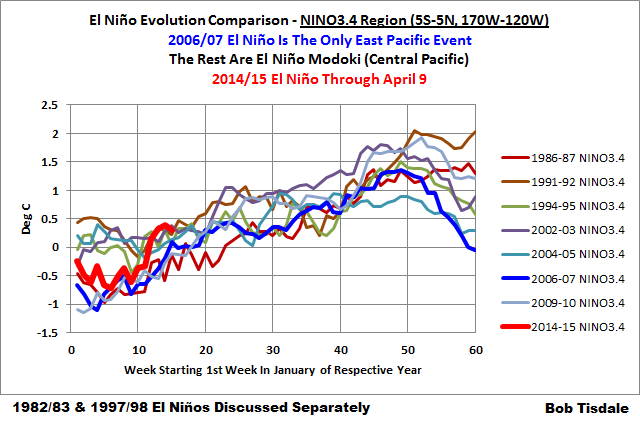 Has the AMO peaked, or will a strong El Nino cause another upward extension of the warming there? And what residual impact will that unusual warming event in the extratropical North Pacific have on ENSO responses there and elsewhere? Thanks Bob, Nino 1 & 2 on the rise so looks like an East Pacific event. If there are toooo many variables for you then I will have to fall back on my other great source of knowledge “Time” he usually comes through in the end! Lots going on at present, SOI and OLR numbers moving about, not in a set pattern yet.